Looking for a job or career in Archaeology? Thousands of Archaeological contractors and consultants from all 50 States work on projects every year. 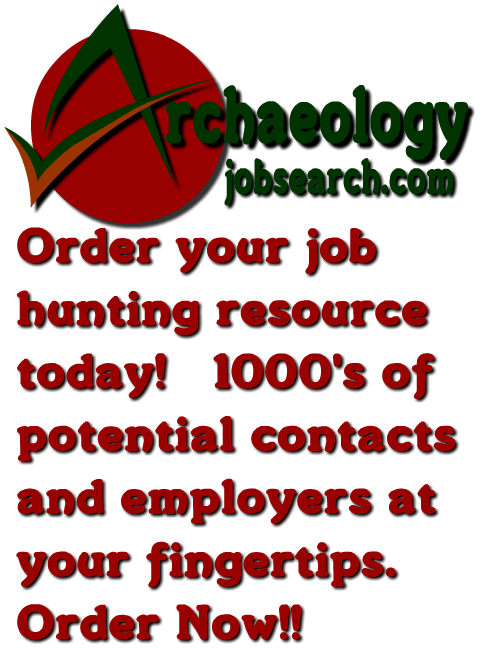 If you are looking for a job in Archaeology, wouldn't you like a resource to tap into this market of employers? How would you like to be able to mail, email, or fax your resume to thousands of Archaeologists across the country or maybe to hundreds in certain locations? We are offering you a chance to get a head start in the job search. Archaeological digs only last so long. Funding, seasonality, or project deadlines makes job hunting all the more important. Whether you are looking for paid field work, unpaid internships, or field school; this is a great resource. For $14.99 you will get a list of THOUSANDS of Archaeological companies and individuals with contact details. These are REGISTERED CONSULTANTS and CONTRACTORS for ALL 50 STATES! They are alphabetized by State. The addresses and phone numbers are listed for each consultant/contractor. Many have faxes and all available e-mails and websites are click-able. The lists are in both PDF and Doc formats for your convenience. This is a great asset to have in you laptop, PDA, smartphone, or PC. Order this great resource now to get ahead in the job search. Click the "buy now" tab for an instant download in both formats. Happy Hunting!